On 25 June 1996, the lives of 19 United States military personnel were lost in a terrorist attack on Khobar Towers in Dhahran, Kingdom of Saudi Arabia (KSA). This attack began the planning phase of Operation DESERT FOCUS, which eventually led to the relocation of approximately 6,000 people within KSA and improved the Command's ability to protect lives and assets stationed throughout Southwest Asia (SWA). Operation DESERT FOCUS relocated people, aircraft and equipment to three primary sites in KSA: Eskan Village, Riyadh; Prince Sultan Air Base (PSAB), Al Kharj; and Eagletown/Site 12, Dhahran. The Army's Patriot batteries and their support personnel remained in Riyadh and Dhahran. The crews at Dhahran moved from Khobar Towers to the Royal Saudi Air Force's King Abdul Aziz Air Base. The crews from Riyadh moved to Eskan Village. The forces from Riyadh relocated at Eskan Village in a matter of weeks, during August 1996. The Army moved to temporary facilities at two sites in the Dhahran area. The US Army in the Dhahran area, scheduled to receive Harvest Falcon assets, decided to repair and renovate modular housing left from Operations Desert Shield and Storm. A $3.1 million contract was awarded for extensive repairs at an existing camp known as Eagletown with 32 trailers and support services. The work required installing water and sewer systems, air conditioners and water heaters, operation of a mess kitchen and dining area, and provision of support services. A $6.1 million contract was awarded for force protection measures such as jersey barriers, blast walls, fencing and lighting; and for operations and maintenance for the temporary housing complex. A contract for operations and maintenance services at agletown, at $255,000 per month, provides for the operation and maintenance of the site, including cleaning, refuse removal, fuel delivery, and maintenance of electrical, water and sewer systems. A $756,000 contract covered communication towers at Eskan Village and U.S. Army Site 12 at Dhahran. Located on the Arabian Gulf, King Abdul Aziz Air Base in Dhahran provides a sunny place to live and work. Humidity from the Gulf keeps the surroundings green. Very pleasant fall and spring weather is set apart by the cool days of winter and the humid heat of summer. The Aramco Compound, virtually a city unto itself, houses hundreds of westerners only ten miles away. The SAUDI ARAMCO facilities at Dhahran include support facilities (which are in general closed to non-SAUDI-ARAMCO employees). The Dhahran Air Base includes the air terminal and facilities for commercial aviation serving the Eastern Province and the training and maintenance facilities for the Royal Saudi Air Force (RSAF). A number of major companies with government contracts or industrial plants have installations within a 20-kilometer radius. The majority, even when located in cities, have residential "compounds", or virtually self-sufficient communities, for their employees. Saudi air bases benefited from long-standing security assistance relationships with the United States. 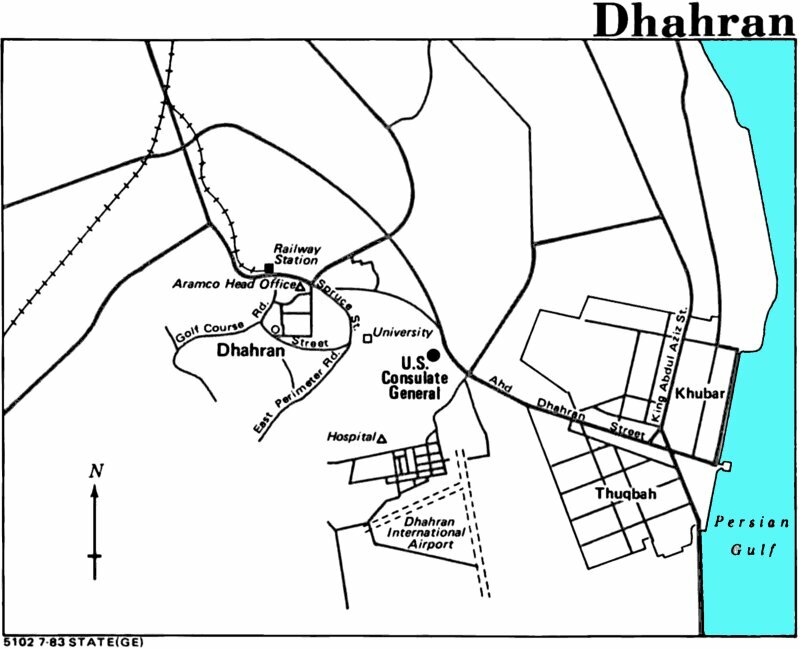 Dhahran served during World War II as a resupply point for US forces in Asia. During the late 1940s and early 1950s, the U.S. Air Force Air Rescue Service, a division of the Military Air Transport Service, consisted of 54 units worldwide. It was organized into numbered Air Rescue Squadrons (ARS), each with a headquarters and four Flights lettered "A", "B", "C", and "D". The 7th ARS had headquarters and Flight "A" in Wiesbaden, Germany. Flight "B" was stationed in the Azores, Flights "C" at Wheelus AB, Tripoli, and Flight "D" about as far away from the United States as one could get without starting back, at Dhahran Air Field, Saudi Arabia. Located just inland of the Persion Gulf. In 1950, Dhahran was the easternmost major US Air Force installation. In 1950-1951 it was a small, almost Beau Gueste outpost, with Quonset huts and tents, a few stone buildings and a couple of runways instead of a legionnaire fortress. The 1414th Air Base Group, MATS, operated Dhahran Air Field. Personnel changes at Dhahran were permitted only twice yearly, in January and July, except for emergencies and these had to be approved by the King's representative. The US Army Corps of Engineers rebuilt Dhahran Airfield in 1956. Saudi Arabia is blessed with modern seaports and airports, as well as a limited number of modern highways that can be used to move troops and materiel. When Operation Desert Shield began in August 1990, however, there was no logistics infrastructure to feed, shelter, and supply a force of the size being assembled. The primary airports of debarkation and embarkation were Dhahran, Riyadh, and King Khalid Military City in Saudi Arabia. The airfield at Dhahran was made the primary airport of debarkation. Of the 7,248 aircraft that arrived in Saudi Arabia between 7 August and 26 March 1991, 6,755 landed at Dhahran. Clearly understanding the importance of enemy and friendly airpower in the desert, campaign planners in Operation DESERT STORM interrupted the initial airflow of the 82d Airborne Division into theater so that more ADA could be quickly inserted. D-Day for ADA in DESERT STORM was not 24 February 91 when the ground campaign began, but rather August 1990 when B/2-7 ADA (PATRIOT) became operational at Dhahran airbase. 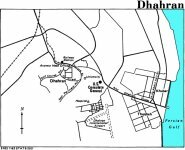 Dhahran is located in the Eastern Province of the Kingdom on the Persian Gulf. USMTM personnel work on the King Abdul Aziz Air Base (KAAB). Personnel live on several compounds that are all minutes away from the USMTM work sites on the Air Base. These compounds are only two miles from the US Consulate General and about ten minutes from the Arabian American Company's (ARAMCO) largest community where many Americans reside. A small commissary is located on KAAB right next to the compound. Fresh fruit, produce, and dry goods are shipped from the States each week. All meat is frozen. The local supermarkets now stock many western products, especially meat. There are 24-hour Safeway Stores in the area, and they carry most US products at a slightly higher price than in the States. The PX/BX is located on the KAAB about a 5-minute drive from the compound. The items stocked are for the most part necessities. There is a fair selection of music, music systems, and camera equipment. Also stocked are household items and small appliances, white goods, office-type supplies, toiletries and personal hygiene items, a few toys, a few clothes, over-the-counter medicines, tools, suitcases, cosmetics, and magazines. Camping equipment and gardening supplies are sometimes available. Keep in mind that the selection of all items is limited. Ordering by catalog is also available. Full service banking is not generally available. USMTM has a check-cashing and currency conversion facility at the Headquarters building. Women cannot drive in Saudi Arabia, so the Mission tries to provide limited transportation for BX, Commissary, and off-base shopping. Excellent shopping is available in the town of Al-Khobar, a 15-minute drive from KAAB. Currently, women are issued taxi coupons for shopping. A variety of individual and team sports are available in Dhahran. The summer climate is rather hot and often humid with temperatures reaching and staying at 120 degrees for days. There is an almost constant wind, and outdoor activities are difficult especially for people with sinus-type problems. During the fall and spring, the weather is pleasant but flies are abundant. The winter provides some rain, cool daytime temperatures, and some cold nights. The USMTM Beach (western-style clothing allowed) is located just 30 minutes away from KAAB. Fishing trips, water skiing, jet skis, wind surfing, sail boating, paddle boating, and swimming are all available free of charge to USMTM members.